Are you just like me, enjoying the combination of different proteins in Chinese meals? So you don’t have to decide if you feel more like shrimp or chicken today, because you can combine the two? 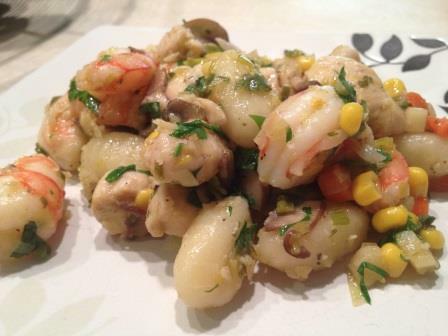 I had some of each at home, and realized that I can combine the two with even crazier combo – gnocchi. 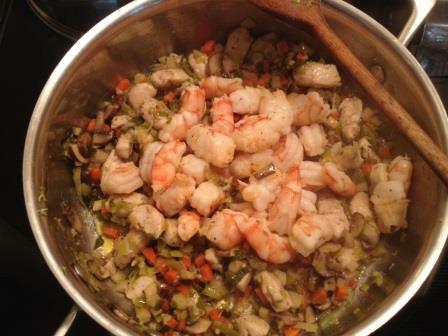 So this is my own Italian-inspired-twist-on-Chinese-Chicken-and-Shrimp… or my Scampi on Steroids. It doesn’t have much from either cuisines but that’s what makes it fun. In the large pan melt tablespoon of butter in 1/4 cup of olive oil. 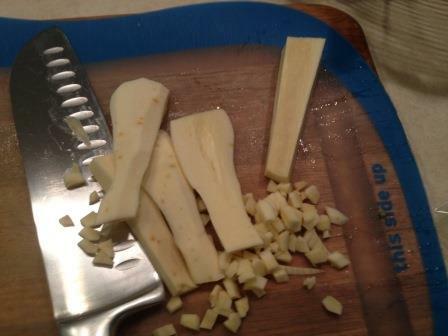 Clean and slice leek – the light part and light green part only. Add to the pan, and saute on medium until nice and caramelized. 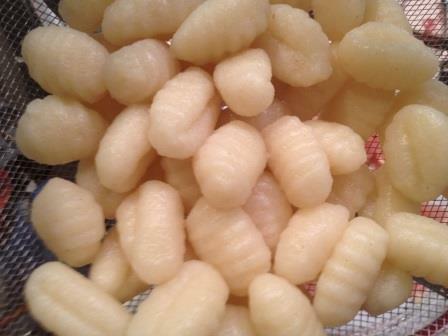 In the meantime, bring 4 cups of water to boil in another pan, add salt and when boiling, add gnocchi. They are done when they float to the surface (about a minute or two). Drain the water, sprinkle little bit of olive oil, so they don’t stick together and put them aside. Peel and chop carrots, mushrooms and turnip. 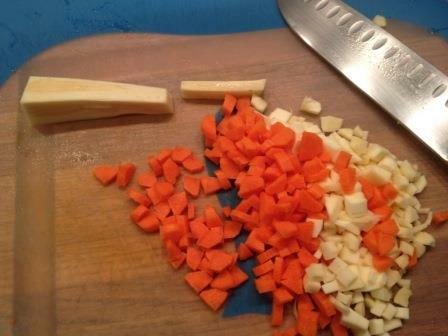 The trick with turnip is to cut around the hard middle part – I usually cut lengthwise from each sides, so it leaves out the hard middle part that I don’t use. Turnip adds an interesting flavors to this dish. And, when cut into small pieces, you can fool your kids into eating some veggies. Because when this becomes the sauce for the gnocchi, accommodating that yummy chicken and shrimp, they wouldn’t even notice they eat vegetables. 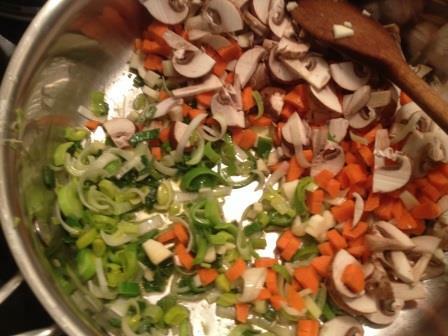 Add chopped veggies to the leeks, stir, season with salt and pepper and continue sauteing on low. When the veggies are sauteing on low, clean the meat and cut chicken tenderloins into bite sizes about the same size as the gnocchi. De-vain and peel the shrimp and do the same. 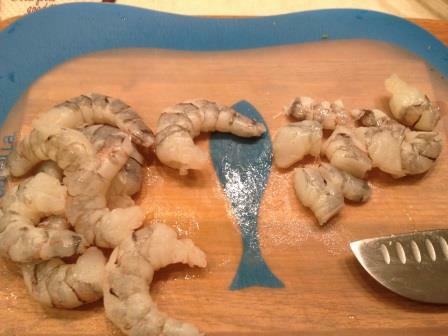 I know – right now you are thinking – why is she wasting the large shrimp when she cuts it into pieces anyway? Well, it’s because the thickness will be about the same as the chicken, and then you get a perfect composed bite of chicken, shrimp and gnocchi. Trust me on this one. By now the veggies are softening, so go ahead and introduce the white wine to the party. At this point I also added pinch of red pepper flakes, because I like it. It’s totally up to you, you can skip the step. Is the other pan, you used for cooking the gnocchi, still sitting on the counter? 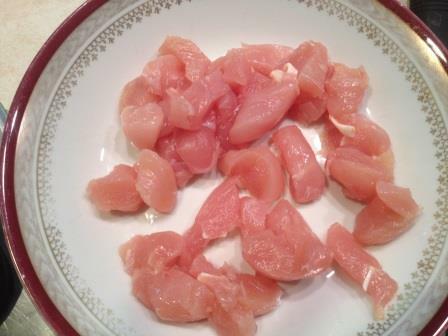 Add olive oil to it, turn the heat back on medium hot and quickly saute chicken tenderloins cut into pieces. Season the meat with Pollo Vesuvio Seasoning directly in the pan, stirring it until the pieces are brown from all sides, and add the chicken to the veggies. Using the same pan, add a little bit of oil if needed, and saute shrimp, stirring it so it get cooked from each side. I didn’t season the shrimp because there was still a little residue from the Pollo Vesuvio seasoning left in the pan, but you can add a little bit of salt, if preferred. 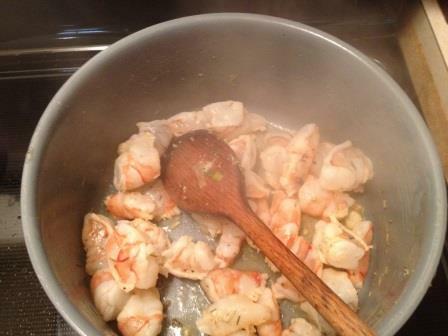 As soon as the shrimp turns pink, don’t overcook it and throw it to the large pan to join the chicken and veggies. Press all the garlic and mix into the dish. Now it smells amazing. You don’t have to worry to be too garlicky – it will cook out, and also, when you later mix it with gnocchi, the garlic will have much softer flavor. 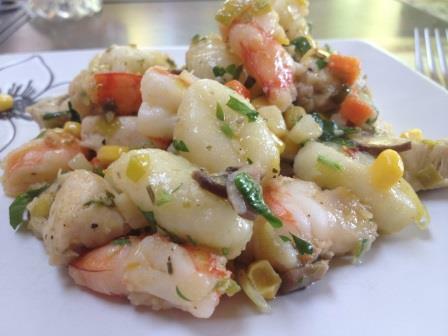 Now all the veggies are nice and soft and created a sauce that will coat the gnocchi beautifully. If it’s too dry, add a little bit more white wine, and/or butter. OK, I promised it’s delicious, I didn’t promise diet food! What do you think makes all the restaurant dishes soooo delicious? You guessed it! B.U.T.T.E.R.! You need a sauce to coat the gnocchi, so the composition will be perfect. At this point I added the sweet corn and cooked gnocchi. 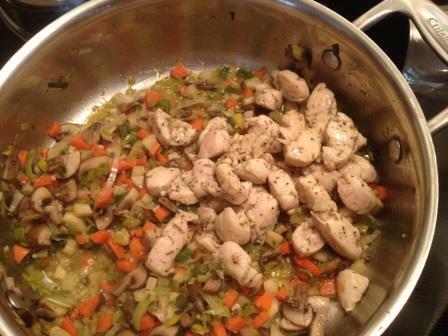 Stir everything together, a quick check tasting for the seasoning, and it was perfect! 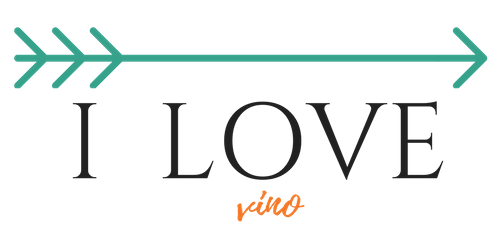 The crunchiness of the freshly cooked sweet shrimp, combined with the sweetness of caramelized leeks and corn, that just burst in your mouth, soft chicken and a touch of heat from peppers… and the garlic that reminds me of shrimp scampi…. but this meal is so much more. The veggies that you wouldn’t even notice at this point created this wonderful composition of flavors for the sauce and all that yumminess wrapped around your soft gnocchi like cashmere scarf. Sprinkle with freshly chopped parsley and all that’s left to do is open a great bottle of white wine (I had Gruner Veltliner with it since it was already opened – remember? I used it in the sauce), and just dig in! I certainly hope you will enjoy this as much as we did. Please let me know! Previous postHappy and Healthy New Year 2014!